If there’s one big difference between Shugo Chara and Shugo Chara Doki, I think it’s that Doki is targeting an even younger age group than previous. With Shugo Chara Doki, there’s this tendency to directly address the audience and present things front-and-center. It’s less Raphael-from-TMNT-nudging-and-winking-at-the-audience and more of a Blue’s Clues/Elmo-style 4th-wall break designed to get young viewers involved. I have to wonder if Satelight and everyone in charge of the anime are trying to draw it away from the otaku popularity it has garnered (check out Hinamori Amu’s high placing in Anime Saimoe 2008), and move it towards the intended Clock Show audience. Or maybe they already know that the otaku already dig it and thus they can concentrate on shoring up the younger side of the fanbase. Of course, some will point out that Shugo Chara Doki is pretty much “filler” to the manga and will cite it as the primary reason the show seems so different. And while the show does seem incredibly episodic, I really do think the main cause of the show’s style changing ever-so-slightly is a desire to draw in younger viewers. 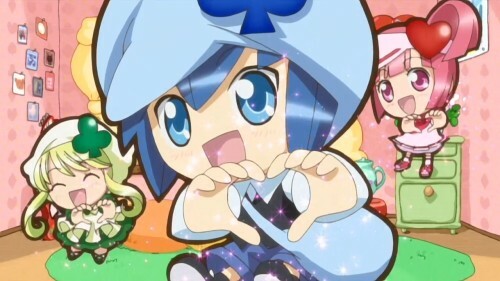 Mixed with the more elaborate transformation sequences and an Open Heart with recoil, Shugo Chara Doki beocmes a sort of Futari Wa Dora the Cool and Spicy Explorer. 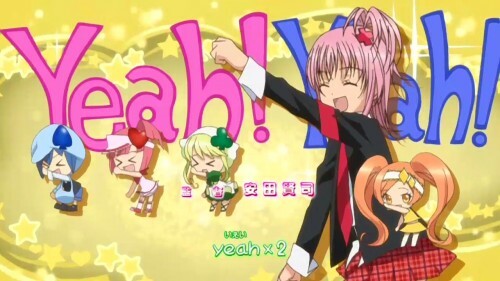 I was spending many hours minutes seconds preparing yesterday’s post (which believes in cool and spicy and is therefore power), using chibi fansubs’ release of episode 1 of Shugo Chara doki. I got to that point in the opening and decided to take a screencap of Amu doing the monkey, but then I panicked. On a whim, I decided to just try to turn off fansubs, and lo and behold the karaoke actually disappeared! Amazing! Why is this amazing?! This should be standard! Please, let this be sign that the disease known as Karaoke Effects is dying, or at least mitigated by being able to remove them at the viewer’s own volition.